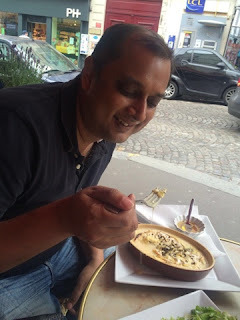 Sometime back I had posted the first of my Paris food blog posts. 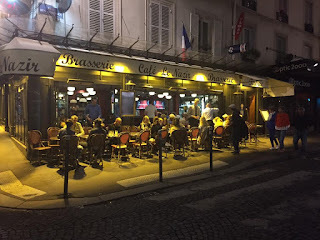 That was on the restaurants or bistros that we went to at the suburb of Montmartre where our hotel was based. 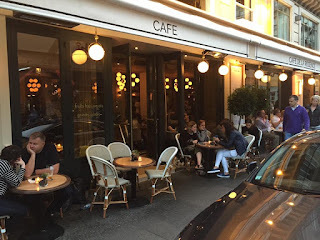 This post is shorter and is on the cafes that we went to in Paris. We fell in love with the cafes there and they became our favourite place to go to. Read on to figure out why. 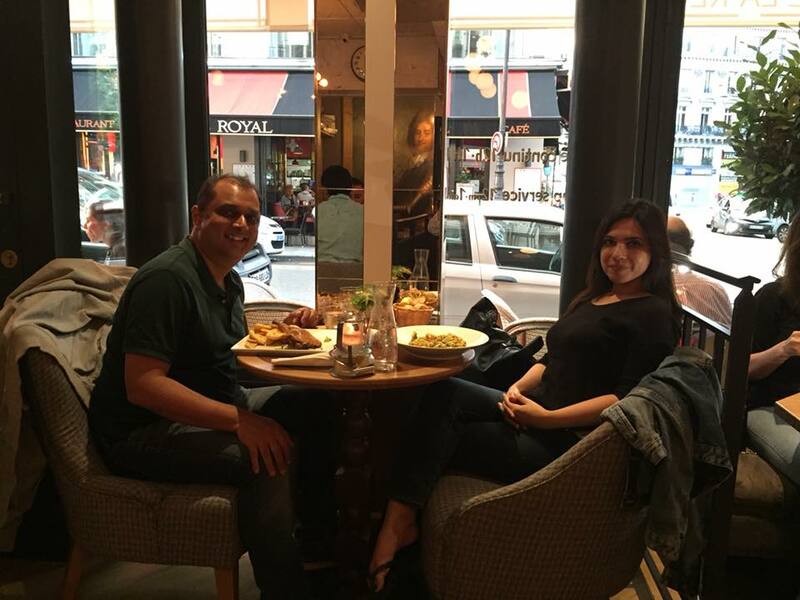 It was fitting that our first meal in Paris was at a café. This was at Le Chinon Abesses at Montmartre. We checked into our hotel, The Joke Hotel (highly recommended though not for if you are on a backpacker's budget) and then stepped out for lunch. We went past the Moulin Rouge and walked up. Most cafes were packed with locals watching France play in the Euro Cup match that was going on. I finally spotted an empty table at a cafe called Chinon and decided to try our luck here. The first thing that touched my heart was the warm and friendly service at the cafe. 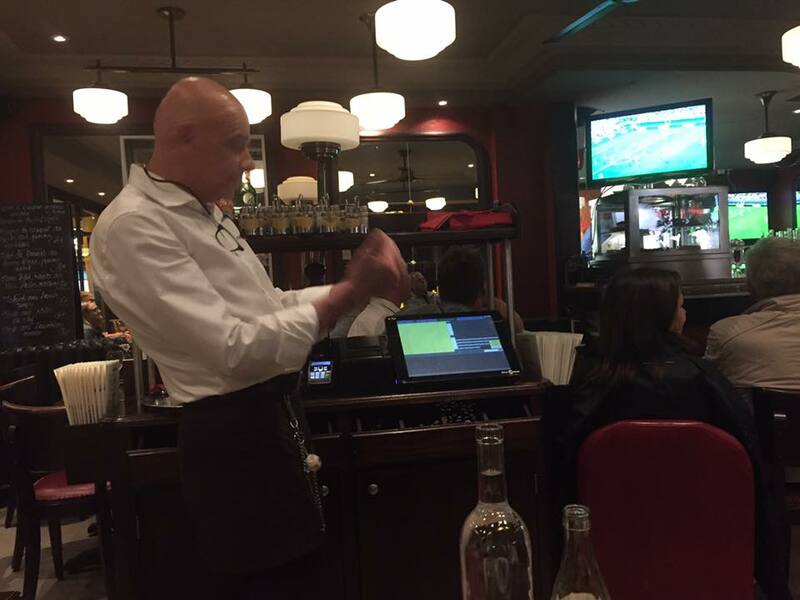 The waiter was attentive and patient despite a France Euro Cup match going on and though they were showing the match on the TV in the café. I had heard and read so much about the apocryphal, snooty bordering on rude, service in Paris that this was a welcome surprise and it did set the tone for the rest of the trip where the service was pretty nice at almost all the places we went to. I had a steak at Chinon. Admittedly not the juiciest of the trip. It was served with an amazing peppery cheese sauce on the side, a delicious ham salad and fried potato cubes. If you love fried potatoes then Paris is the place to go to. Each café and restaurant that we went to served a different version of fries and each was epic. K had a French onion soup at Chinon and found it nourishing and tasty. She was famished after our train ride from Cannes and wiped the bowl clean. 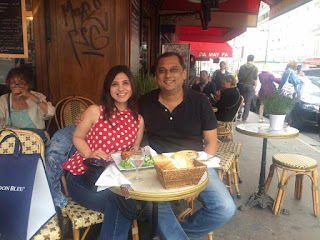 Most of the cafes that we went to in Paris were different from the image of Parisian cafes that I had held till I actually went there. For some reason, I had thought that the cafes would be small, pretty places that are pink with lot of pastries. These places do exist in Paris, but they are called patisseries and not cafes. The cafés of Paris, on the other hand, seemed to be places where people meet for a drink and a smoke. They have a basic menu to choose from. The dishes on offer were largely the same at most places that we checked out. Many of the popular cafes that we went to were pretty old. At times more than a hundred years old. The furniture was wood dominated. The look, vintage. Despite their age, the cafes were neat and clean and well maintained. Most offered free wifi and had clean toilets, sometimes located in the basement. The cafes had a seating area inside, and then lots and lots of tables crammed against each other on the pavement outside. You chose the outside section, if you were a hundred year old French granny who wanted to smoke. Or a tourist who wanted to take in the beauty of your surroundings. We had gone in June when it wasn't too chilly but not as hot apparently as it should have been and we could sit outside. The crowds in the cafes were a mix of tourists and locals. Compared to India, the number of wait staff per cafes or restaurants Paris were few but they were very attentive, warm, often spoke in English and seemed passionate about the food served and had a point of view on our orders. A bit like waiters in older restaurants in India who have worked in these places for ages and are proud of their jobs and the food that they serve even if they don't always know English. I find this involvement with the food often missing with the younger staff in newer restaurants back home. 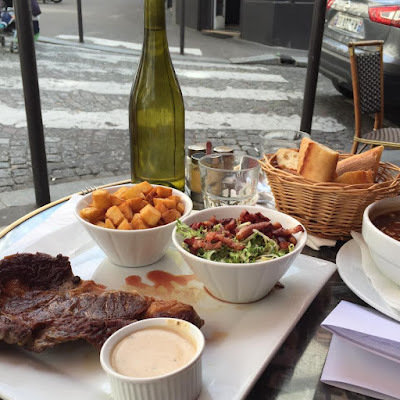 Another difference is that in the cafes and restaurants in Paris, all the food would be brought at one go if there were more than one person, specially if you specified that you want so. This doesn't happen in the modern restaurants in Mumbai that I go to where the food is brought as and when ready, which means one person might get their food while the other might not. We find this most bugging and were very happy when K and I would get our food at the same time, every time in Paris. The food in the cafes of Paris that we went to ranged from brilliant to competent. Here's some more on where we ate and what we ate in Paris. 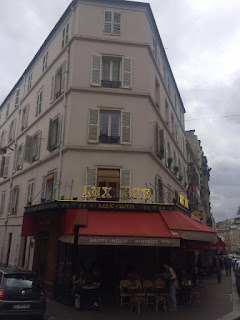 The best café food experience that we had in Paris was at Lux Bar in Montmartre. We walked in there late one afternoon, hungry. Didn’t know anything about the place. Was too famished to try to find out a 'recommended' place so we decided to try our luck here. I ordered the French classic, croque monsieur. It turned out to be two slices of very good quality bread, with ham in between. The bread was covered with ementhal (cheese). The whole sandwich was grilled and served hot. The crunch of the bread was perfect. The quality of the ham and cheese superb. The flavours very bold. The seasoning perfect. The pleasure it gave, unbridled. 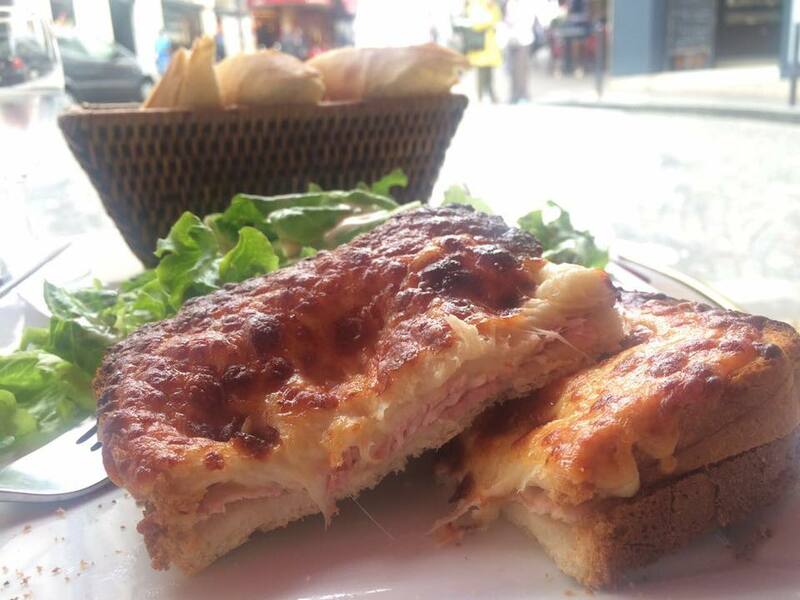 I saw a croque monsieur at a more fancy bistro later, ordered by someone else, and felt that the one at Café Lux looked more scrumptious. If you add an egg on top of the croque Monsieur, it apparently becomes Bawi (Parsi woman) and they call it Croque Madam! Parsis love eggs and often add eggs to dishes in case you didn't get the context of what I just said. We sat outside Lux at one of the tables on the pavement as the street in front was very beautiful. The tables were placed close to each other and there were two French grannies puffing away on their cigarettes at the table behind us. We also had a baked camembert at Lux. I broke the crust with a fort and delicious cheese oozed out. It was seasoned with a bit of dried rosemary I think. If a dish ever smacked of forbidden passion, then this was it. 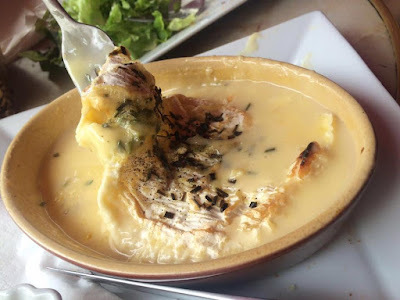 The French baked camembert made the fondues that we had earlier eaten in Switzerland seem so tame in contrast. Our cheerful waitress dashed to the boulangerie (bakery) opposite the café and came running back with a baguette in her hand. She sliced the baguette and served it to us. The bread was wonderful and on the house. You dip the bread into the cheese and eat it. She offered us more bread when we had finished what she had served. There was some honey served on the side with the baked camembert. The waitress said that the honey is traditionally added in to the camembert. She served it separately as she said preferred to have the camembert without the honey herself. I tried both versions and figured out that she was right. It indeed tasted better without the honey. The waitress seemed genuinely hurt that we didn’t finish the camembert but it was very heavy and really beyond the two of us to finish. Later, when I told the folks at the Hotel Joke, where we wee staying, about Café Lux, they told us that it was a more than a century old café and was once a popular hub for jazz musicians. There is so much history in Paris that there is no getting away from it even when you don’t go out actively looking for it. Following my friend Khushboo’s suggestion, we went to Angelina for its hot chocolate soon after we reached Paris. 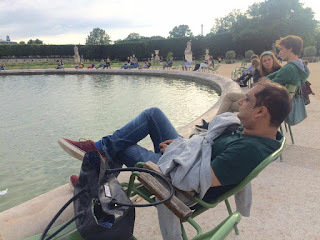 We hen walked into the lovely park called Jardin Du Tuleries, which is close to Angelina and sat down by the idyllic pond there. This was the moment of calm and peace that one seeks for in the middle of a hectic trip. We then walked up to the annexe of the Louvre though the museum was shut that day. 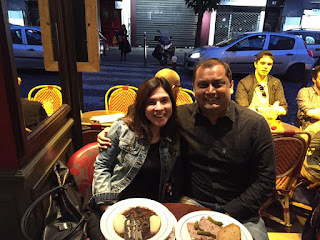 We decided to have dinner somewhere close by rather than after we returned to Montmartre where our hotel was. We went out of the Louvre complex and walked around and then walked into Regence as I liked the vibe of the place. While the place looked new and fresh, it turned out that the café was more than a century old. They had maintained the old world charm and yet spruced up the place. There were café tables on the pavement outside. The inside section, where we sat, was very classy and gave you the feel of a fine dining place rather than of a cafe. It had comfortable seating, nice toilets, very warm service, wifi of course. They obviously didn’t take their heritage for granted and had kept up with the times. A lesson for our Irani cafes and Kareems and Nizams perhaps? I saw the French classic, duck confit, on the menu and ordered it. This was the first time that I had tried the dish. The snuggle-worthy and succulent pieces of duck meat, and the seductive and well flavoured bits of duck fat and skin, had me in their spell. The parsley potatoes served on the side were drenched with duck fat and so decadent. The bread served with our food was indeed ‘very good’ as the waitress said it would be. K enjoyed her pesto pasta and liked the way it was flavoured and I appreciated the liberal sprinkling of pine nuts it. 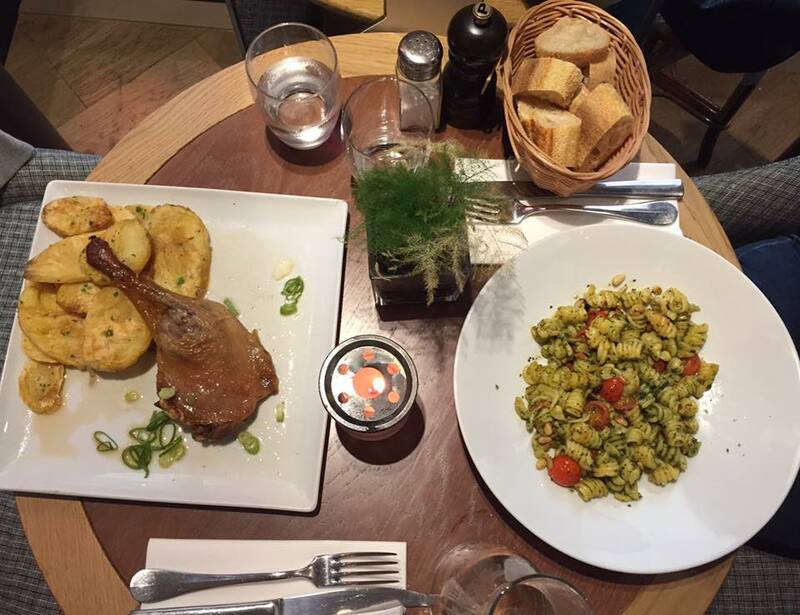 The cost of the duck confit and a pine nut specked vegetarian pesto fusilli was 30 euros. Prices in other restaurants in the area were similar. 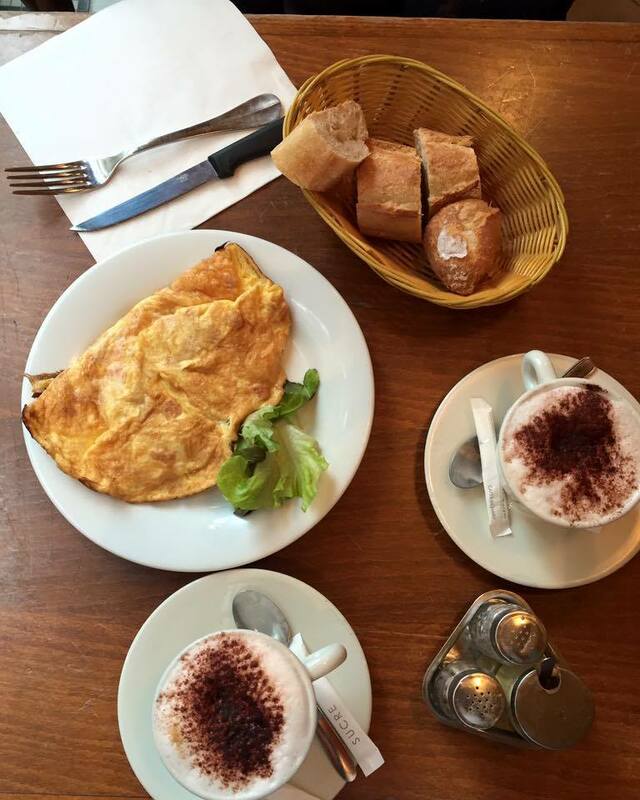 I had a most brilliant French omelette at Café Rivoli Park near the Louvre. 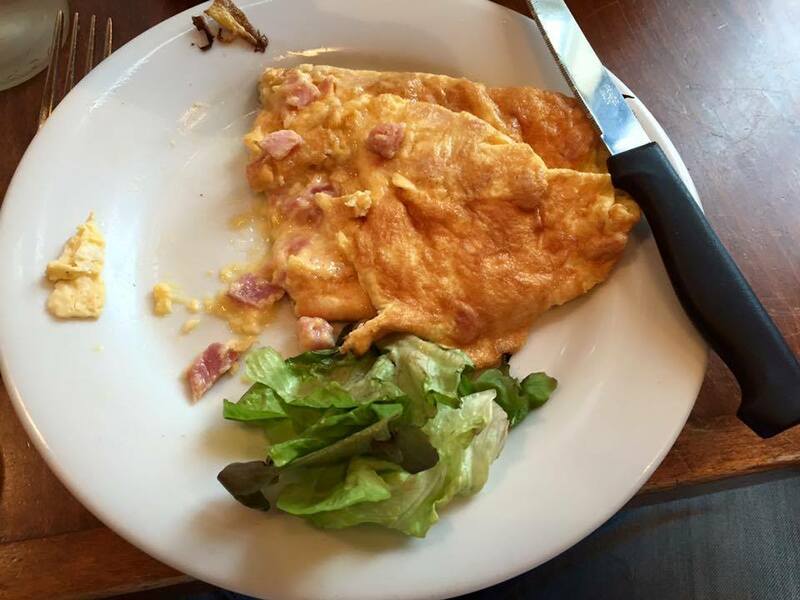 I am not sure if the menu said just 'omelette' and not French omelette! This was on our penultimate day in Paris. 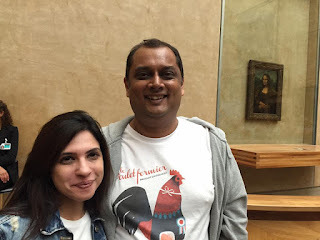 We had gone in to see the Mona Lisa at the Louvre. 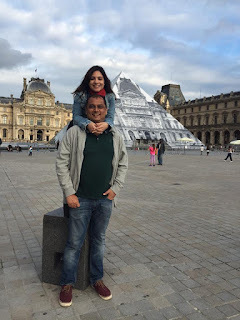 For me this was special as the last time I was at the Louvre, my dad carried me on his shoulders as they didn’t allow prams inside, according to my mom. Mona hadn’t aged a bit since then. This time I walked. For miles! You have to go through quite a bit of the Louvre to see the Mona Lisa. Which, if you aren't an art lover, is probably all you will want to see. There were some nice book shops just outside the Louvre by the Sienne. A bit like College Street in Kolkata. I bought some nice posters there including of Babar the elephant, whose books I loved as a child. We thought we would go to Angelina, which is close to the Louvre, for tea. The queue was too long. The draw of the hot chocolate of course. Thankfully we had been there earlier. So we walked into Café Rivoli Park. Hadn’t heard of the place before but it looked warm and comparatively ‘modern’. I ordered a ham and Gruyere omelette from the menu. The omelette was possibly one of the best I have ever had. The 'outer skin' had a nice bite to it. The egg was runny inside the way I like it. The flavours of the ham and cheese very powerful, yet in harmony and not discordant. It was served with lovely bread. Mona Lisa would have smiled. I grinned. Two very nice cappuccinos with the omelette came to 24 euros. Bread was served on the side. Le Nazir at Montmartre looked like quite a popular place and we went in one night for dinner. The tables outside were packed. We preferred to sit inside in any case as it was night and inside seemed more cosy. The TV sets were showing a Non France Euro Cup match. We had a boozy beef stew which was interesting but too wine doused and meaty for us to finish. 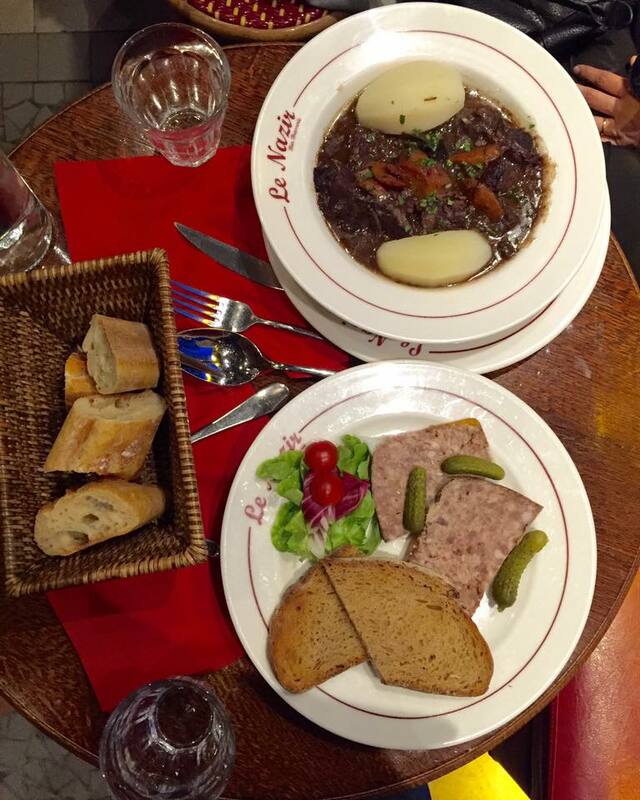 It was not the beef boullion though which is possibly more a winter dish. You get the boullion and coq au vin only in winter I was told. I think having the stew when the weather was cooler would have been nicer. There were slices of boiled potato, and possibly radish, in the soup. These were added at the the end possibly as they didn't soak in the flavours of the stew. The meat was obviously slow cooked and very very tender. The pork terrine was nice . Tasted like a slice of meatloaf. The vibe of the cafe was very pleasant. What was most memorable was the elderly, bald, grandpa-like gentleman who served us. He was very prim and proper and yet warm and courteous when he took our order. A bit later a couple of young girls came and sat down at the table next to us. Grandpa suddenly got very excited and chatty seeing them and even offered to take their photographs for them. The girls seemed to be tourists. There were locals at Le Nazir too. There was a French family who had come for dinner with their granny. Meal done, granny stood up, her grandson and the waiter held her on two side and walked her to the door where she sat down on her wheelchair. Then we too said goodbye to dadu (grandpa) and left feeling warm and fuzzy. We were in Paris for a week and went largely to areas where tourists go to. This post is based on just that. 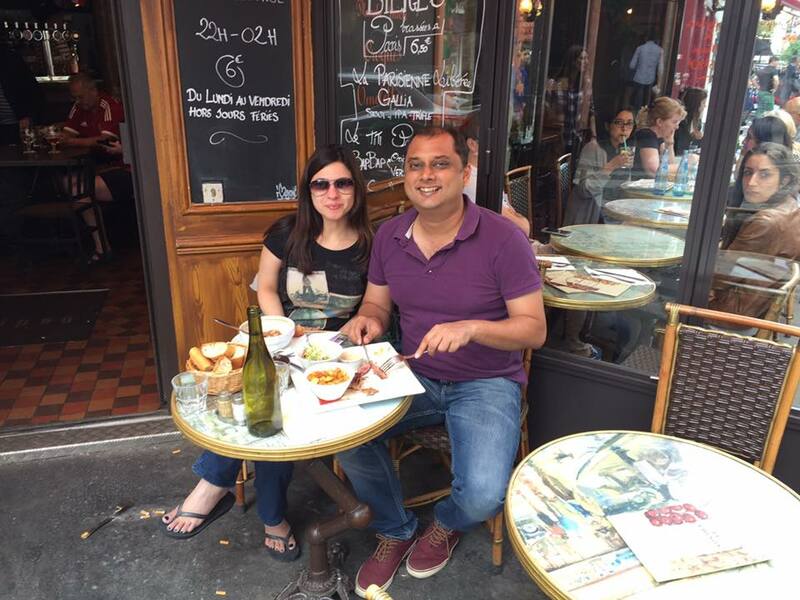 I am sure that there is a lot more to the cafes of Paris than what we picked up. You need a local to tell you more about them of course. I admit that I am not entirely sure about the difference between a cafe and a bistro as some of the larger cafes seemed like restaurants. The thing to keep in mind is that Paris is a huge city with cafes all over so don't try to follow a list. You will go mad. Chart your own path instead, make your memories. Find your own happy place. We found many.